Ampoe (district) Pai is situated in a volcanic area with a series of geological faults. The sub terrain temperature is calculated, in places, to be between 130 and 180°C. 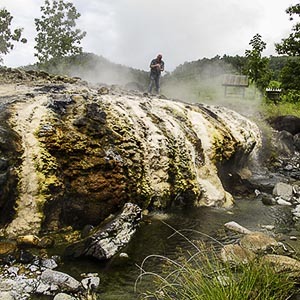 A forty minute drive through the beautifully scenic Huai Nam Dang National Park is rewarded by a geyser at the roadside that gushes out of the ground at a constant 95°C. The water flows along a short stream and into the Pai River a couple of yards away. As it flows into the river, the water still has a temperature of 90°c! We will purchase some eggs and boil them in the spring. We'll eat the eggs with some sticky rice and enjoy a cool drink, whilst dangling our feet over the stream and sitting in the steam — very good for a healthy complexion. 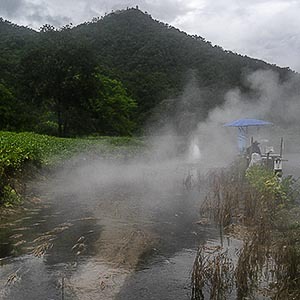 Muang Paeng Hot springs are just 10 kilometres further down the road. They cover an area of approximately 100m by 30m; larger and more impressive than Muang Rae Hot Springs. Here the water bubbles out of the rocks over the whole area, forming pools and riverlets that flow into a stream. You won't be bathing here! The stream has a temperature of 80°C. The water bubbling out from between the rocks is, again, over 90°C! The stream flows for about a kilometre, slowly cooling, before it too flows into the Pai River. On the way home, we'll stop off at Tha Pai Hot Springs, for those that wish to bathe or even just hang their feet in the warm water. Tour Price: THB 700 per person, including eggs, rice, and a stop for noodle soup. The THB 200 entrance fee for Tha Pai Hot Springs is not included in the tour price.